So Damon just stays there killing her every 5 minutes, occasionally switching off with Caroline when he gets bored until such time as she returns to hell permanent because, as her mother has just shown. Hey they could do the same for Katherine. Problem solved! Except they don’t do that. They act like there’s absolutely nothing they can do to stop Vicky ringing the hell bell. They even get Matt and daddy matt (it’s the last episode of the last season, damned if I’m going to remember this pointless character’s name) to appeal to her. Rather than just, y’know, sit on her. This whole scene is so bizarre. You literally half more than half a dozen people all fretting because they can’t stop a normal human woman climbing a clock tower and ringing a bell. Hell, Matt and Daddy Matt could just disable the bell?! This makes zero sense. Bonnie is nearly killed by using her magic to survive the fire but the gang manages to revive her – but not before she has a near death dream all about… Elena. In which she declares herself ready to die for the sake of Elena waking up again. Of course she does. She’s been gone for 2 seasons. Bonnie I still all about precious Elena. The epic moment comes from Bonnie’s spell in which she invokes a gazillion Bennet ancestor and Oh dear gods WHY WASN’T THIS THE STORYLINE ALL SEASON?! WHHHYYYYY?! Wait… oh, no – sorry scratch that, we’re sad about Stefan being dead. My bad. Boo Matt isn’t dead. How did he make it to the last season?! Elena wakes up because Bonnie has now broken Kai’s spell which would have been interesting if anyone had even tried to do this at any point in the last 2 seasons. And I can kind of get why they went there because they didn’t want to end on a low note. But I think a solemn reflection over all of those they’d lost would have been better than just “we were all reunited in the afterlife!” to remove that poignancy in favour of fluffiness. However, this does allow me my headcannon: Meteors fell on Mystic Falls. Everyone died. Which is why they’re all the same age in the afterlife! That ending scene where you had Bonni surrounded by her ancestors – which would link so well to how the Covens have been developed in The Originals WHERE WAS THAT? There was your storyline! There was two seasons of storyline right there – Bonnie and the Bennet witches! Especially with the added motive of bringing Bonnie back by breaking the spell. 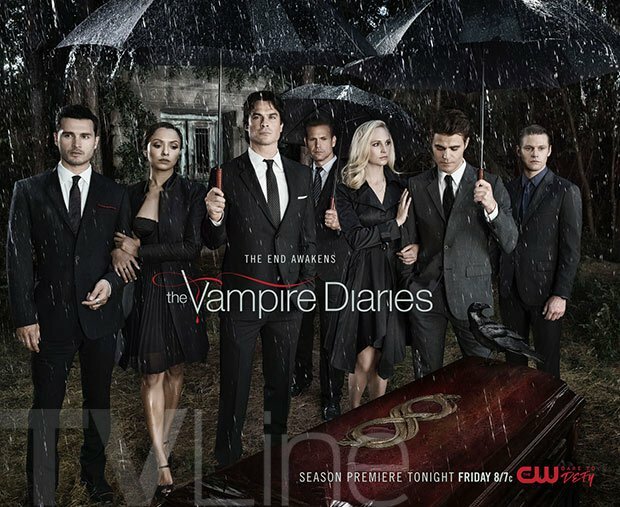 Add in Caroline and her magical off spring with Stefan and Damon as SIDE CHARACTERS: Damon supporting his utter best friend Bonnie in her journey of self-discovery, Stefan discovering where he rests in Caroline’s life. Which leaves us for Bonnie… who has been so lost and confused for so long and we’ve written post after post about her because she deserves better, so much better. We have no LGBTQ characters in this season for which I am sincerely grateful. And it is now over… it’s always a little sad to lose a show after so many season, but I think everyone will agree it was time.